Ontario, Canada -- I found this book at an area used bookstore in a sort of zen happenstance. At the end of last summer I sold my little retreat, ZenRiver Gardens, and part of the clearing up process has been finding new homes for the poetry books from the small library. As someone involved with writing and promoting poetry for my entire adult life, hundreds of other books of poetry have found refuge on my bookshelves. Now that I'm in my late 60s, though, I feel it's time to 'wabi sabi' my life, to simplify my surroundings and myself, so I've been taking small boxes of books to The Bookworm used bookshop in the nearby village of Madoc. So to the book ... I highly recommend anyone interested in zen, or any form of Buddhism, read this book. I've often wondered about the very formal and structured practice of zen, and Anne Rudloe kindly takes you inside her mind, retreat after retreat, revealing aspects of how the discipline, refined through these retreats, has enriched her personal life. Anne is a doctor of marine biology, so she's no hippie dippy dabbler in Buddhism like me. Anne has the strength to sit for hours, day after day, in retreats far afield with a room of strangers - not my cup of tea or choice of meditative surroundings. I found Anne's internal monologues during zen sitting extremely honest and personal. She clearly remembers her early difficulties with meditation, the trouble with just letting go, stilling the movie scripts we all incessantly run through our consciousness. After her early retreats, though, Anne quickly finds benefits in dealing with interpersonal relationships. She was raised near the Florida panhandle by her grandmother, who sounds like an archetypical Florida cracker. The fiercely stubborn, fiery old lady constantly gets Anne's goat, until in a moment of clarity and compassion learned through her meditations, Anne finally snaps back. Surprisingly, the raw emotional honesty of Anne's response makes the old lady laugh, and the two develop a stronger bond than they've had for most of their lives. Extended passages of this book read like haibun. There are beautifully descriptive passages of the marshland gulf coast of Florida, where Anne and her husband run a small aquarium and marine animal supply business. Of course there are also sections where Anne struggles to articulate zen insights, and like almost everyone who attempts to describe these moments of awareness and insight in prose, well, we all come off sounding like secondhand Deepak Chopras or Eckhart Tolles! 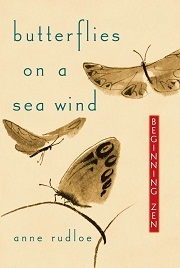 I Googled butterflies on a sea wind with hopes of finding a pic of the cover, and I was very pleased to learn the book is again in print and available from Amazon. Great reading on many levels. Postscript: I just Googled Anne, and she died of cancer in 2012.